I'm told that people have been predicting the imminent downfall of the US dollar since the Stock Market Crash of 1929 and the Great Depression but yet somehow it still persists as the world reserve currency. I'm 'moving along' past details like the creature from Jekyll Island(which is a very good book) and government sanctioned deals with Saudi Kings creating the petrodollar. Since the very beginning of the US dollar there have been various threats against it and yet still it persists as the worlds reserve currency - even when Nixon dropped the gold standard. 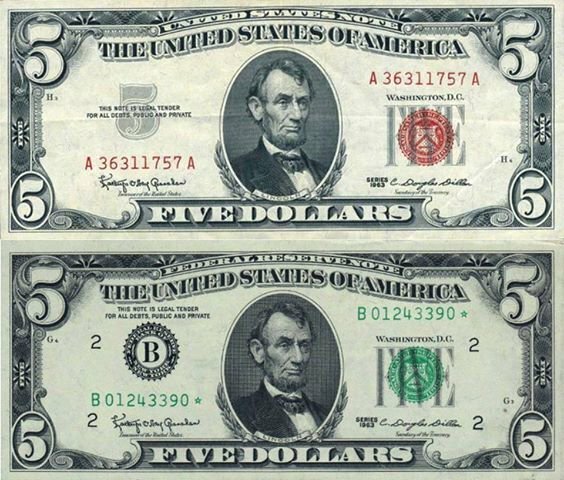 Highlights of the story include the assassination of Abraham Lincoln and John F. Kennedy as both presidents had created their own money system to run the United States and put the US dollar in the hands of US citizens - which would be a good idea for any citizen of any country and many people don't understand the facts that their national currencies are privately owned by central bankers and that there would be outrage and revolution overnight if people comprehended the facts but I digress. Top bill printed courtesy of JFK in 1963, reads "United States Note", while bottom bill reads "Federal Reserve Note"
Noted columnist Paul Krugman's comments about the dominance of the US dollar underwritten if you like by "men with guns" got me thinking about another reason why cryptocurrency is fast becoming the killer-app of the internet and is this unstoppable train. So modern day instances of using the old big stick to protect US dollar dominance is when the US Invaded Iraq - one of the reasons was that it's cash cow would be negatively effected if Saddam Hussein hadn't stopped selling Iraqi oil in Euros and after the ground Invasion in 2003. Also the threat from Muammar al-Gaddafi when it was discovered that Libya’s plan to create a gold-backed currency to compete with the dollar was a motive for military intervention. I think it's completely not given enough weight or credence if you like for a peaceful, prosperous and fair way forward for the human family. One of the foundational reasons why everything is so messed up on the planet is because there is no easy way for humans to trade fairly (also use something as a store of value) although gold and silver does have some merit and it seems some ancient & possibly extra-terrestrial reasons why gold has always been used traditionally on planet Earth. There is some interesting research about making our earth currency 'compatible' with some other off-world civilizations which I will post about one day. So I'm predicting that we will see some rather large chaos and disruption in the ongoing US dollar fiasco and I predict that the writing is on the wall for the US dollar as a reserve currency and I suspect all the smart money has already gone to China, India as Russia and that the threat of dollar dominance using the threat of force will ring hollow as the reality of where the human family is going starts to focus into view. So when the inevitable happens as has done with all currencies since the very creation of money on this planet when the US dollar crashes, it seems obvious to me that the next world reserve currency will be crypto currencies and it's almost being used as one already IMHO. If I put my prophecy hat on and look into the next 5 years of the US dollar I don't see it surviving, * unless Donald Trump pulls out some of that secret and confiscated Nikola Tesla technology and bring real free-energy to the masses, it ain't going to be pretty for holders of US dollars. And while I'm speaking about investing, it must be remembered that there are many more things to invest in other than financial gain like your health, your community, your family and many other things! excellent analysis. the US has definately been using their power over the dollar over more things than we realize and you are also definately correct. both china and russia haved stepped away from doing oil and natural gas transactions in US dollars instead opting for their own currency.